Welcome to a tribute to a wonderful arcade classic that ate more of my money in the early 80s than I care to remember. Crazy Climber, manufactured by Nihon Bussan Co. Ltd., holds a copyright of 1980 and was available in both upright and cocktail table versions. Its game play was simple; Make it to the top of the building without getting knocked off and falling to your death. My story? OK, I'm guilty of growing up during the "video game" craze. 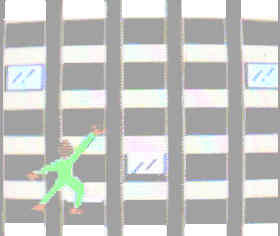 I was 14 when I got into video games, but never got really good at any of them with the exception of Crazy Climber. But being of that age (14), there was nothing I would rather do then get away from Mom and Dad for a couple hours a day with my friend Eric to go pop some money at the local arcade. Space panic was one of my first favorites. It was a Lode Runner type game but also had a timer to complete a level. Pac Man, Polaris, Centipede, Tron, Qbert, Tapper, Venture, Berserk.... I dumped tons of quarters into these guys! But as we all do, I grew up and left some of my youthful toys (sigh) behind. Or until recently. I happened across a CD ROM some months ago entitled Williams Arcade Classics. The ROM advertised itself as being a collection of the Williams arcade games Defender, Defender II, Joust, Robotron, Sini Star,and Bubbles. Now the collection was not my favorite listing of games from the past, but I picked it up none-the-less. It turned out to be an excellent game value as the games are emulated 100%! But there was one more bang for the buck I didn't expect that changed my life. The CD also had 20 or so minute interviews with the original programmers of their above mentioned games. They told the story of the rise of the arcade market and the stress and goals that had to be overcome in a time when electronic games were still in their infancy. I flashed back so fast, I knew I had a new hobby on my hands. Three weeks later I started my collection after accidentally passing a store locally that shares my same infatuation with arcade classics. After speaking with the store proprietor for some time my enthusiasm to start collecting grew even stronger. I went to work the next day and told my buddies of my new desire to start this hobby and stated that I had to start off by finding a Crazy Climber game. Well as luck would have it, on of the guys knew some one who had a Crazy Climber Cocktail Table in his basement and might want to part with it. Well I got it! A limited edition Crazy Climber Cocktail Table game in my den and my hobby as a collector has begun. SELECT GAME FOR ONE OR TWO PLAYERS.